It's a new year for Harry and his friends and enemies, but some things remain the same. The Dursleys are still abusive, someone is trying to kill Harry, and Hogwarts becomes a center of terror as opposed to a school of learning. Harry Potter (Daniel Ratcliffe) misses his school and his friends, Ron Weasley (Rupert Grint), and Hermione Granger (Emma Watson). He must spend the summer with his guardians, Uncle Vernon Dursley (Richard Griffiths), Aunt Petunia (Fiona Shaw), and his dreadful cousin Dudley (Harry Melling). Harry is surprised to find an elf in his room (his uncle and aunt most reluctantly and angrily acquiescing to moving him from the cupboard under the stairs). It's Dobby (Toby Jones), who warns Harry not to return to Hogwarts, for his life is in danger (tell us something we didn't know). Dobby causes trouble for Harry, and the Dursleys hit a new low in their abuse of Harry: Uncle Vernon now literally holds him prisoner by placing bars in his window to prevent him from going back to Hogwarts (begging the question, given how much the Dursleys hate Harry, why are they so desperate to hold on to him rather than essentially toss him out?). Needless to say, Harry does go back, aided in an escape by Ron and his brothers, who pull the bars with their flying car. More mysterious mishaps: Ron & Harry miss the train and have to take said flying car to Hogwarts, which causes more 'hilarity'. In their second year, in between Herbology Classes and a new Defense Against the Dark Arts instructor, a braggart and teen heartthrob named Gilderoy Lockhart (Kenneth Branagh), we get more murderous mayhem. 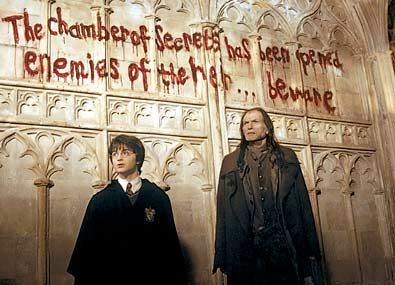 Harry hears voices warning him of danger, and then, written in blood, we have the message "The Chamber of Secrets has been opened. Enemies of The Heir, beware (at least it rhymes). The suspects of who opened the chamber (and is The Heir, in this case heir of Slytherin House) are many: Draco Malfoy (Tom Felton), Hagrid (Robbie Coltraine), even Harry, who can speak with snakes. Hogwarts is becoming more and more dangerous: students, even ghosts like Nearly Headless Nick (John Cleese) are being Petrified (frozen in a near-death status). Harry discovers a book that appears empty, but is really a diary kept by a Tom Marvolo Riddle (Christian Coulson), which gives him details of when the last time the Chamber was opened, pointing at Hagrid. They go to Hagrid, and he tells Ron & Harry (Hermione having been Petrified) to follow the spiders, and in The Dark Forest the giant spider Aragog tells them Hagrid is innocent. Eventually, Ron & Harry discover where the Chamber is, go down inside, and confront the memory of Tom Riddle, who is really...guess who? As The Smiths would say, Stop Me If You Think You've Heard This One Before. Harry Potter & The Chamber of Secrets, again directed by Chris Columbus and again scripted by Steve Kloves, is essentially the same story, with some new additions I grant, as The Sorcerer's Stone, at least it is to this Muggle. Side note: I think this is why A.) I stopped watching the Harry Potter films, and B.) did not read anything after The Sorcerer's Stone. You start with monstrously abusive guardians, then danger for Harry at Hogwarts, followed by an investigation (complete with false clues), with Harry having two people go with him only to have to face danger (He-Who-Cannot-Be-Named) all alone, said villain being defeated, and then all ends well and back to Muggle-Land. Besides a few new details: Dobby, whom I kept calling 'Doobie', the flying car, Draco's father Lucius (Jason Isaacs), there isn't much difference between the first and second films. It is a case of 'you've seen one, you've seen them all'. In fact, I wouldn't blame anyone for thinking that every Harry Potter book will be variations on a theme. Of course, the second is different from the first in this regard: I hated this one while I merely didn't care for the first. I hated Dobby, who looked like a cross between The Lord of the Rings' Gollum and Star Wars: The Phantom Menace's Jar Jar Binks in looks and voice respectively. If you think of it, he appeared in the beginning and end of Chamber of Secrets, and what exactly did he add to the plot? I hated the Dursleys (and still wonder why few if any people have called out J.K. Rowling for having such vicious child abuse in her books and/or making all Muggles look so evil--I can't think of any other Muggles in Chamber of Secrets). How is literally imprisoning our protagonist can be considered anything other than idiotic and over-the-top? I hated Moaning Myrtle (Shirley Henderson), a whiny, quite appalling child ghost (always fun having to explain ghosts of dead children to the little tykes, isn't it?). I hated the flying car: while it might pleased the fans to see it in the film, the whole sequence in the film took so much time and, again, what exactly did it add to the plot? All the above are certified classics, better than Chamber of Secrets, and surprisingly, a lot shorter. There are a few films that, granted are actually longer than Chamber of Secrets: Lawrence of Arabia, Ben-Hur, Gone With The Wind. I'm willing to wager that not even the biggest 'Pot-Head' thinks Chamber of Secrets is on the same level as any of the aforementioned films, at least if they've seen any other films other than Harry Potter ones. Columbus and Kloves didn't know when to cut, and one soon becomes tired waiting for the actual story to begin. The story is about who opened the Chamber, not about how Harry & Ron are never punished by Hogwarts administration like their House Leader Professor McGonnagal (Dame Maggie Smith). In fact, that's what I thought about as the film ended: no matter what happens or what Harry, Ron, or Hermione do, they never actually face consequences in terms of school discipline; in fact, quite the opposite (the administration actually appear to help/coddle our heroes). No suspense or worry that they will be punished no matter what/how many rules they break leads to no real worries about what will happen to them. Another point of contention with Chamber of Secrets is the excessive amounts of Deus Ex Machinas in the film (perhaps in the story as well, not having read the book I can only judge the film). Deus Ex Machina (or D.E.M. for short) is when something magically appears that resolves whatever situation our heroes face that will get them out of trouble/danger. For example, when Aragog's children menace Harry & Ron and they can't find a way out, that damn flying car magically appears to spirit them away. Side note: seeing how Ron & Harry basically stole the car from King's Cross Station, I kept wondering how Mr. & Mrs. Weasley got back to their home which I figure must be in Muggle-Land and not Wizarding World, otherwise there would be no need for Platform 9 3/4. Also, a scene where Hermione's Muggle parents are at Diagon Alley makes me wonder how Muggles can be allowed into Wizarding World and how they get in/out. Just a thought. When Harry has to face Tom Riddle in the climatic battle, we have three D.E.M.s: the Phoenix, the Gryffindor Sword hidden from the Sorting Hat the Phoenix brings, and the Phoenix's tears. Oh how very convenient. I have no idea how the Phoenix could navigate the subterranean lair of Hogwarts or how it knew to have the Gryffindor Sword and place it inside the Sorting Hat, unless Dumbledore put it in there even though we shouldn't imagine he actually is getting involved in this as much as he is...oh how very convenient. The performances were varied. Branagh, known primarily for his Shakespearean roles, relished the opportunity of vamping it up to the Nth degree, even though Lockhart is so obviously inept it's a wonder how anyone could have thought he was good at anything. His feature role appeared to be at the cost of Smith (who if memory serves correct wasn't in the film all that much), Coltrane (still delightful but much diminished), and Richard Harris' Dumbledore (still slightly tottering around and tragically dying shortly before the film was released). The children have gotten better. Radcliffe's Harry is a young man starting to embrace his heritage, evolving into more wizard than Muggle. Felton matches him (albeit in a smaller role) as a sheer villain delighting in his growing evil and snobbery, complete with henchmen. You can see how much Potter and Malfoy detest each other in the duel between them, and this speaks well of both of them that at such young ages they can portray a fierce rivalry convincingly. The best one is Grint, who manages the shifts of childish fear with Aragog and his children to his anger at Lockhart's reluctance to help rescue his sister to his ineptness with his broken wand to his courage in going down into the Chamber. Never does Grint hit a wrong note in the various shifts of character, making Ron Weasley one of the most believable of the Potter characters as well as, after Hagrid, my favorite character. Watson was frozen (literally, she was Petrified by...guess who), but her reaction to being called 'mudblood' (someone of Muggle heritage) did come off as a bit whiny and not as one who could cast better spells than all the Malfoys for all their racial purity. The special effects were all right but nothing extraordinary, but unfortunately used to stretch the plot rather than serve the plot. When Ron & Harry face Aragog & his children, my mind found it impossible to not wander into the Doctor Who story Planet of the Spiders. I never got a great sense of fantasy in Chamber of Secrets, and that I believe is not just because the story was far too long, or that it appeared to be a repeat of Sorcerer's Stone, but because the visuals (and the sets, especially in the Chamber itself) called attention to themselves rather than serve the plot. 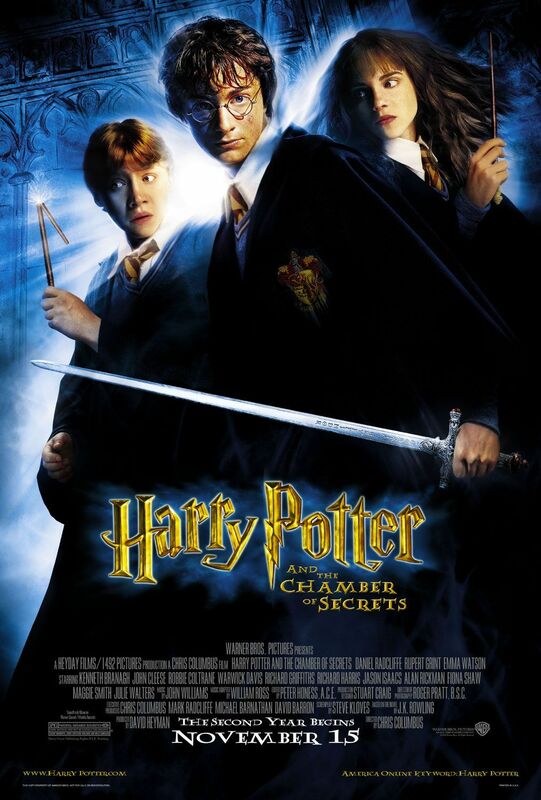 There were frankly too many things I disliked about Chamber of Secrets (Dobby, that damn flying car, miraculous rescues for Harry, the repetitiveness of the plot from the last film, the actions of the Dursleys) to counter the good things (Lockhart, the first hints that Ron & Hermione might become more than friends, the Wizard newspaper The Daily Prophet). A line from Chamber of Secrets stuck out to me: "Funny, the damage a silly little book can do..." I think this is as apt a description for Harry Potter and the Chamber of Secrets as I can find. I wish they would get on with the story and stop horsing around.